Description: Enter this adorable 3/2 brick home in the community of breckenridge to find a functional, open floor plan offering a family room with a mantled cozy fireplace, alcoves & cutout display shelving. Kitchen provides breakfast bar, large pantry & sunny windowed nook. Master suite has garden tub with octagon window, huge walk-in closet, double sinks. Split bedroom plan, convenient interior laundry room. Newer roof (2013) a/c (2011) plus a 100% on demand (16,000 watt) generator, termite bond & r19 & r37 insulation! Enjoy the outdoors in the peaceful sunroom overlooking a manicured backyard w/privacy fencing. 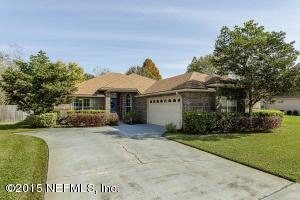 This is a fabulous neighborhood off cr220; a-rated schools; close to fleming island shopping & nas jax! A very comfortable & clean home with all the charm you are looking for! Grab it now!